Welcome to North Shore Charters! Martha's Vineyard's oldest & best fishing charter! If you want to fish for world class Striped Bass and Bluefish on the island of Martha's Vineyard then Captain Scott McDowell knows the spots to catch the big fish. Martha's Vineyard Island, Menemsha, and surroundings waters off the Elizabeth Islands offer the best fishing near Cape Cod and the islands. The fishing off Martha's Vineyard is considered the best on the East Coast by many anglers and Captain Scott McDowell has been charter fishing the waters off Martha's Vineyard for over 20 years. Caption McDowell has been charter fishing longer then any other fishing charter on Martha's Vineyard. Fishing the waters off Martha's Vineyard for over 35 years, North Shore Charters knows where the big Striped Bass, Bluefish, Tuna, White Marlin, Sharks and other big Martha's Vineyard Fish are, so come out on the Martha's Vineyard waters for a day of fishing you won't soon forget. It was a rainy day out on the water and North Shore Charters was the only boat out fishing, that is when 12-year old Molly Fischer, a Martha's Vineyard native, caught a monster striper aboard "Slapshot 2". 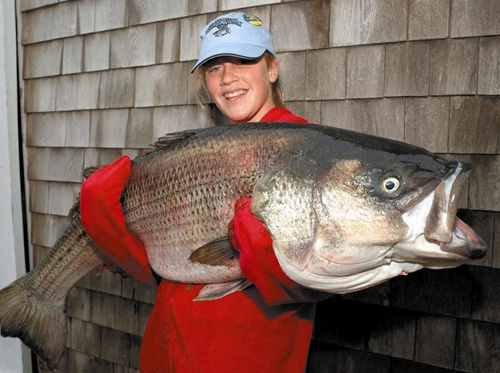 When all was said and done Molly weighed in the heaviest fish of the 60th Annual Martha's Vineyard Striped Bass and Bluefish Derby, a 49.22 pound Striped Bass. Check out this photo of Molly's record catch. Charter fishing aboard "Lauren C" you will enjoy a wonderful day of fishing. Check out our fishing photo gallery of trophy fish caught aboard "Lauren C". Looking to catch a Derby Winning Fish during the Martha's Vineyard Stripped Bass and Bluefish Derby, book a derby charter now to catch that trophy Striped Bass, Bluefish, Bonito or False Albacore. If you want to fish the Vineyard waters on Martha's Vineyard's best fishing charter make the trip to Menemsha, North Shore Charters has upgraded it's orginal "Bass n Blue" boat to the "Lauren C" a 35' custom Duffy fully equipped - Coastguard licensed vessel. Check our our fishing charter rates. To book a fishing charter with North Shore Charters, just contact us by phone or email and we'll get you out on the water. Half or Full Day, fishing for Striped Bass and Bluefish. Fishing for Tuna, Marlin, Mahi Mahi and Sharks.